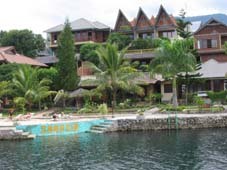 Samosir Cottages, Tuk-Tuk, Somasir Island Lake Toba, is one of the nicest and most relaxed places to stay in Tuk-Tuk. 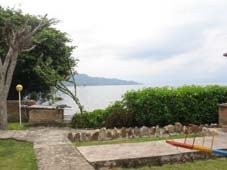 Right on Lake Toba, with clean rooms, a great restaurant and internal activities like swimming in the lake, BBQ area next the lake, pool/snooker table, ping-pong table, internet access and a TV/DVD room for watching movies. 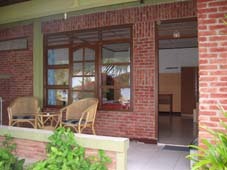 They also have several computers with fast cable internet access. Wednesday and Saturday night they have a free performance of traditional Batak Dancing and folk singing. These are the published room rates for 2009. Prices can be negotiated at better rate in quiet periods. I enjoyed my short stay :the room was spacious and the bed and bathroom clean. The food was very nice, too. Mr Blum was especially helpful in getting me settled and making me feel welcome. I will stay there again. 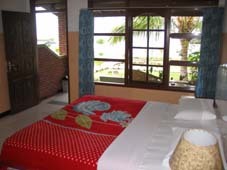 Samosir Cottages is a very nice mid-priced homestay. Staff are friendly and helpful. I have stayed there twice (5 days each time), and would do so again. Four internet terminals, good food, and some interesting restaurants and bookstores close by, plus Brandos Pub a few minutes walk away. You will not be disappointed in this place. Don\'t pay the prices quoted above, though. More like 60-70,000 for the standard rooms, and 80,000 for Comfort rooms with hot water. 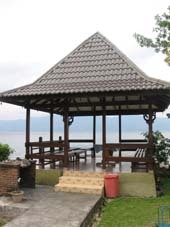 Samosir Cottage is a lovely cozy relaxing place with beautiful surrounding facing the lake. The restaurant is very nice with Internet service and a friendly barter Blomma who can speak Swedish. Every Wednesday, they have beautiful Batak music and dance. 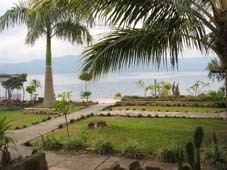 Have you stayed at Samosir Cottages?